We're not too proud to admit we were the TV theme song jukebox of our elementary school's cafeteria. (We remember a kid named Earl calling out titles of TV shows for us to sing.) Our favorites were "Dallas" (which is actually even more awesome in its French incarnation), "Just Two Good Ol' Boys" (natch) and the "A-Team." 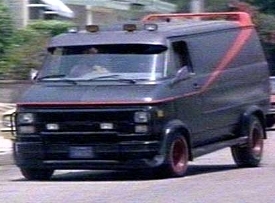 Plus, the team of crack commando pariahs had a wicked-cool custom van, which we were saddened to see in a dilapidated state on a Universal Studios tour back in the '80s (along with a similarly abused Selleck-driven Ferrari 308. Have these Hollywood types no sense of decency? We're sure George Peppard is rolling in his grave. It's the Love Machine! It's the Hill Valley Transporter! It's Super Van!